Version Checker is a small mod that will show updates for mods in an easy list. Mods currently add version checkers which will spit out a bunch of text to the chatbox at startup of a game, which get's cluttered very quickly. This mod will add a small button at the main menu when it detects an outdated mod. The number represents the number of found outdated mods. When you click the button an interface will come up, showing you all outdated mods, their version number and the update available. Mod can register updates in multiple way, making it easy to implement. When you double-click on a mod it will open a window with the change log (if available). If a mod has given Version Checker a direct link it will auto-download the mod for you and place it in the correct folder automagically! If a non direct link is given you'll be able to open the page where you can find the update, easy! When you've updated all your mods, a quick restart is needed to remove all old mods (it does that automatically too!). And you're done! I have a Patreon page where you can support me with a monthly donation. This is very much appreciated! Does this only read from mods that have their own internal version checking, or does it check the version number against Curseforge? Because Twitch is less than reliable for me when it comes to showing which mods have newer versions. VersionChecker is meant to check mods that don't have their own version checking. It works with any mod that either registers itself through their own code or is listed on NotEnoughMods. Does this still automatically install and delete old versions of the mods? How this mod works on Minecraft 1.12.2? EDIT: Oh, I just noticed that the 1.10.2 version I uploaded to CurseForge two years has actually been rejected by Curse and doesn't show up on the Files page. Will fix soon! Hello, I'm a Chinese player. Can I share your mod to mcbbbs? The mcbbs is Chinese largest forum of minecraft. The forum prohibition of share meaningless mods, I think your mod is very meaningful, very good! This forum sharing mod have to ask the author for advice. If I can share your mod ,I will mark the author. And this page will be the only download link. Hello,I'm a Chinese player.I think your mod is very interesting.Can I share your mod to mcbbs? 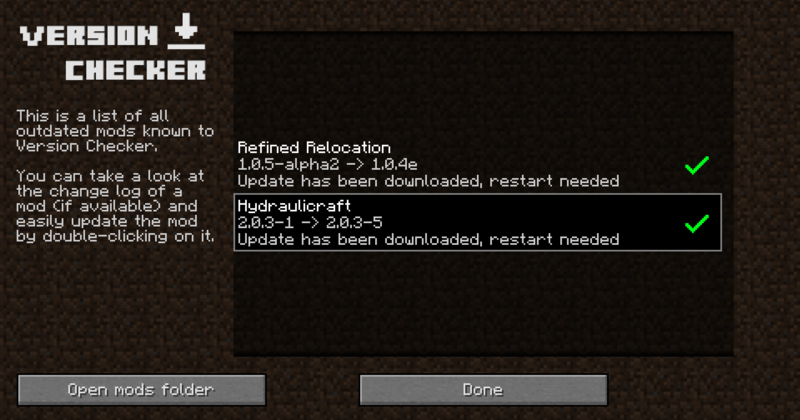 Uhmm this mod is not working in 1.12.2, I'm certain that around half of my mods are not up to date, but the version check button is not appearing. Has anyone found a way to make this mod work with Beta/Alpha versions of the mods? Many of the mods I currently use are all in beta/alpha, and Version Checker only looks at Release versions. Is there a 1.10.2 version planned? but I am using Custom Main Menu, is there a way to make it work with it? Use the following lines in /config/CustomMainMenu/mainmenu.json as a framework and edit them if necessary. 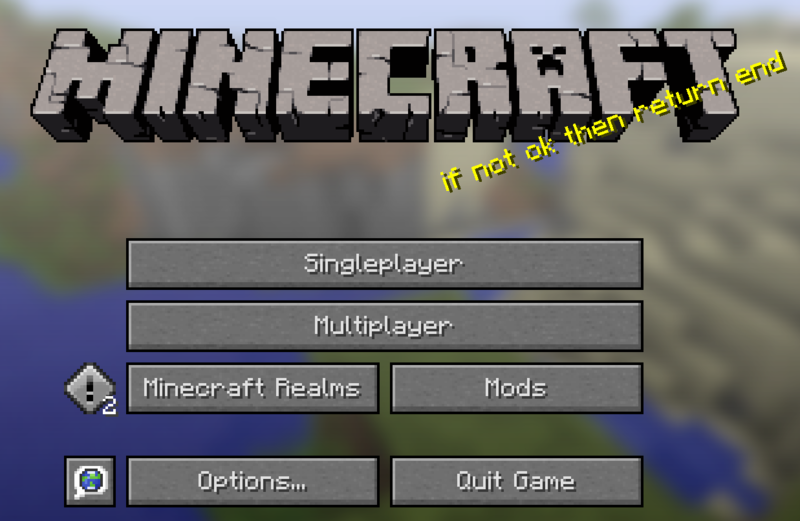 These lines use the FTB Revelation main menu format, so it might not fit your current settings. The button does work, and I haven't had any issues with it so far. Good luck!